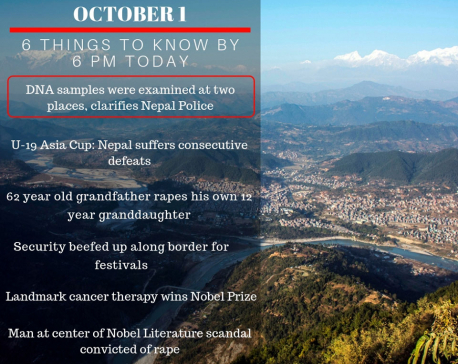 KATHMANDU, Oct 18: Mahanawami, the ninth day of Bada Dashain, is being observed throughout the country today. Animal sacrifices and special offerings are made at ´Dashainghars´ and ´Kots´ or armories as well as at the shrines of various goddesses and Shaktipeeths today. Since early morning today, a large number of devotees visit the temples of goddesses Mahakali, Shri Mahalaxmi and Durga Bhagawati. Devotees also throng the shaktipeeths of Dakshinkali, Guheshwari, Maitidevi, Kalikasthan, Naxal Bhagawati, Bhadrakali, Shobha Bhagawati, Bijyeshwori, Indrayani, Naradevi, Bajrabarahi, Raktakali, Bajrayogini and Sankata and offer prayers and sacrifices. According to tradition, prayers are offered and Durga Saptasati recited at the Shaktipeeths today. The festival is considered to be of special importance because goddess Chamunda had slain the Raktabij demon on this day of Mahanawami. Chicken, ducks, goats, sheep and buffaloes are sacrificed in this festival. Vegetarians offer coconuts, radish, bottle-gourds, etc. Machinery, arms and vehicles are cleaned and offered sacrifice on Mahanawami, the last day of Nawaratri. 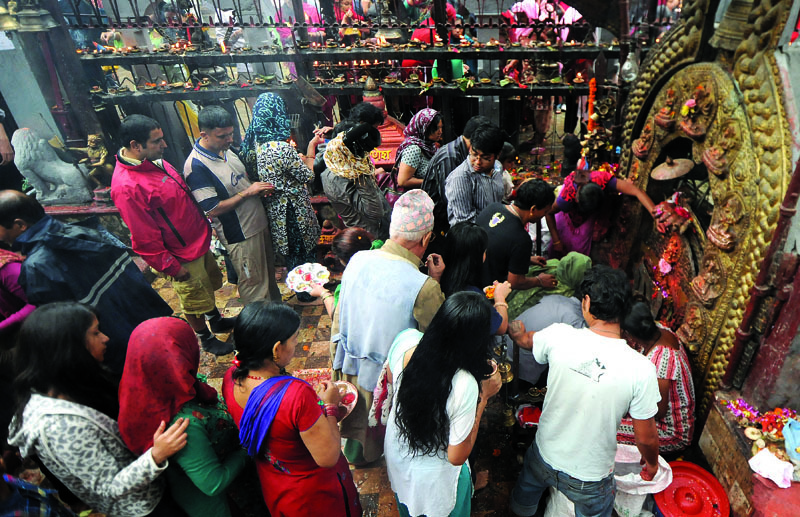 Thousands of devotees offer worship at the Taleju Bhawani temple at Hanumandhoka. This temple is opened only once a year on the day of Mahanawami. The worship of Sri Durga Bhawani at Dashainghars over nine days concludes formally on the day of Bijaya Dashami after the Abhishekh or sprinkling of holy water takes place marking the beginning of Tika.